Thomas Jones was a Welsh landscape painter who was a pupil of Richards Wilson, 1763-65, and went to the Royal Academy Schools from 1769. 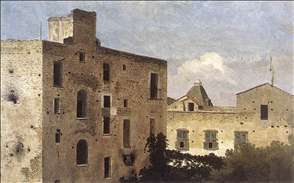 He was in Naples and Rome 1776-83 (his memoirs of this period were published in 1951), and there he painted small landscapes on the spot, very like those to be painted much later by Michallon, Valenciennes or even Corot. He gave up painting professionally on his return to London, but continued to exhibit at the Royal Academy, 1784-88, and in 1798. 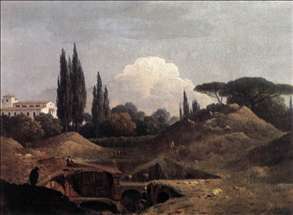 There are six of his Corot-like landscapes in the National Museum of Wales at Cardiff. See more details about "An Excavation"
See more details about "Houses in Naples"